POST NUMBER 50!!! My ongoing expedition of ‘Feeding Your Appetite’ has been an extremely fulfilling one so far. This blog has given me the opportunity to continue to challenge myself inside and outside my tiny kitchen! It’s been a rollercoaster ride that’s included interesting innovations of classic recipes, amplified flavors and several kitchen disasters (yes there’s plenty of messy behind the scenes stuff!). And yet it is still the beginning of my humble march into in the vast culinary world. No hallmark card can say “I love you” like a homemade sweet treat for your sweetie! This easy, elegant and delectable recipe, features just in time for Valentine’s Day to help you express your true feelings for that special someone. Nothing spells romance like chocolate and strawberries and this dessert marries both these ingredients. The star this Valentine’s Day is creamy white chocolate, perked up with an underlying hint of fresh strawberry juice. If you prefer raspberries, you can entirely substitute the strawberries with raspberries. Setting this mousse in chocolate cups (the perfect aphrodisiac) creates a patisserie equivalent masterpiece. All you need with these is a bottle of bubbly and it won’t be long before you are showing that someone special how you feel ….in more ways than one! Happy Valentine’s Day! Place a handful of strawberries in a blender and puree them. Place this puree in a sieve and use a spoon to press the fresh juice through the sieve. Keep the juice and discard the seeds and skin, leftover in the sieve. The eggs must be at room temperature to get the most volume out of the whites when you beat them. Make sure the egg whites have no traces of yolk in them. 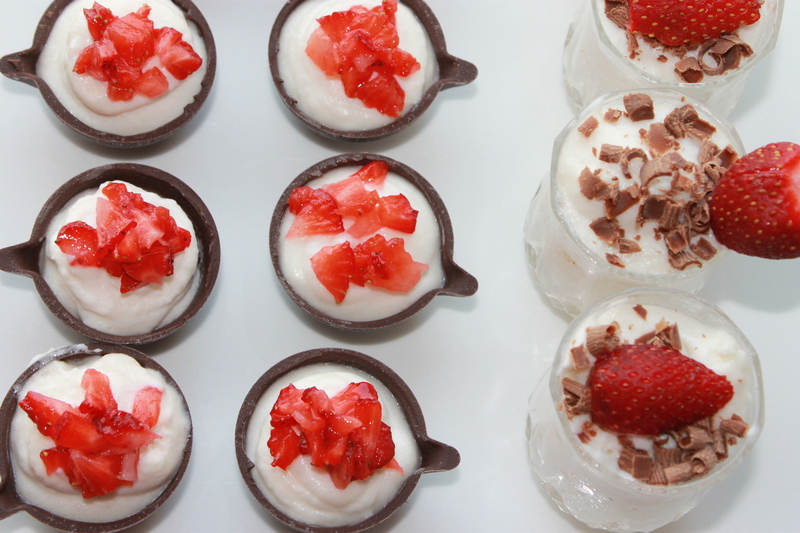 Most large grocery stores, gourmet food and party stores carry chocolate cups or cases for setting desserts in them. These can also be ordered online. If you cannot find these, just set the mousse in shot or cordial glasses and increase the amount of chocolate shavings. 1) Create a double-boiler over the stove-top and melt the white chocolate in it. Keep stirring so that the chocolate does not burn. 2) Stir in the milk and strawberry juice into the melted chocolate and set aside. 3) In a separate bowl, stir the lemon juice into the egg whites. Turn on a hand-held electric mixer or an electric stand mixer on low, and beat the egg whites until stiff peaks form. Fold the chocolate mixture carefully into the eggs whites. Be careful to not deflate the air volume that has been incorporated into the egg whites. 4) In a separate bowl, using a hand-held mixer or a stand mixer on low beat the heavy-cream until it forms soft peaks. Gently fold the whipped cream into the chocolate mixture. 5) Divide this mousse into chocolate cups or cordial/shot glasses and chill for at least 3 hours. 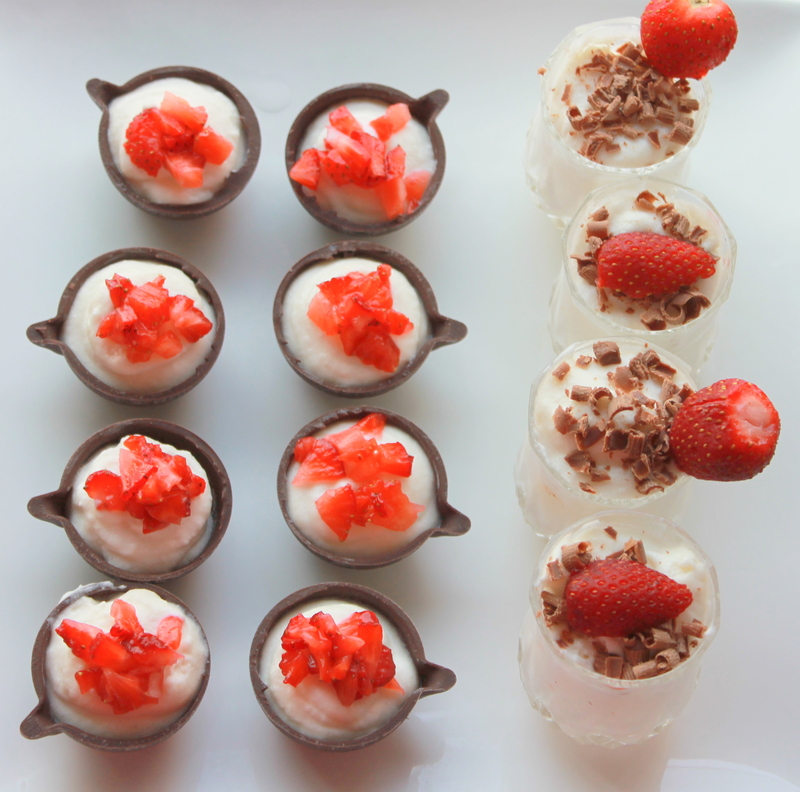 You can use a piping bag to make the mousse look even fancier in the cups. 6) Just before serving garnish with chocolate shavings and chopped strawberries. I have taken longer than usual to post a recipe as I was en-route to India, followed by an onslaught of jetlag and a plethora of friends and family to catch up with. Amidst all this frenzy, I am basking in the immense pampering that comes with visiting my parents’ and relishing the diverse foods of Mumbai that I so miss in DC. Not only do I miss the food, but also the importance that is placed on all meals, specifically breakfast. Breakfasts are an elaborate affair in most Indian households, especially at my parents’ place. While the menu is ever evolving, a staple at their breakfast table is an abundance of heart-warming cups of masala chai. Masala chai is a tea drink prepared by brewing black tea with a mixture of aromatic Indian spices and herbs. The combination of spices and herbs may vary but green cardamom and ground cinnamon are common ingredients. At breakfast, earlier this week while I was sipping contently on my second cup of masala chai my husband broached the subject of making chocolate truffles. I am always looking to switch up flavorings for chocolate truffles and the apt timing of our conversation lead to developing this chocolate truffle recipe. These luscious truffles melt in your mouth, revealing a magnificent synchronization of earthy masala chai and creamy, decadent chocolate. Try these at your own risk – you will probably pack in more truffles than you serve your friends and family! 1) Place the bite-sized chunks of chocolates in a medium glass bowl and set aside. 2) In a medium saucepan, heat the cream along with the tea bags, cardamom pods, cinnamon powder and honey on medium-high heat, until it reaches a boil. Once it reaches a boil remove from the heat and set aside for 30 minutes. Squeeze the tea-bags to get all the flavor out of them. It takes about 30 minutes for the chai flavors to infuse into the cream. 3) Re-boil the cream mixture and remove from the heat once it comes up to a boil. 4) Using a mesh strainer, pour the boiling cream mixture over the chocolate chunks and let it rest for 2 minutes. Discard the teabags and cardamom pods. Use a whisk and slowly start mixing the chocolate and cream until you get a smooth mixture. It is important to do this slowly to ensure that minimal air bubbles enter the mixture. 5) Now add the butter and whisk well, till it is fully incorporated. Cover with cling wrap and refrigerate for a minimum of 12 hours. 6) Take a large bowl and fill it with cold water and ice cubes. Remove the chocolate mixture from the refrigerator. 7) Dip your hands in the ice-bath and then dry them completely. Roll the chocolate mixture into one inch size balls. Note: I use a rounded tablespoon measure to ensure that all the truffles are even in size. I usually need to repeat the step of dipping my hands in the ice-bath and drying them 1-2 times in the middle of rolling out 24 truffles. Body heat melts the ganache and makes it difficult to form even balls. The ice bath step helps reduce this. This is a messy and tedious but extremely rewarding process. 8) Place the rolled balls in a serving platter and refrigerate for another 6 hours. 9) After 6 hours (or more) remove the chocolate truffles from the refrigerator and coat them with cocoa powder or crushed pistachios. 10) Refrigerate the chocolate truffles for at least another hour after coating them and before serving. The amalgamation of chocolate and orange is a match made in heaven. I recognized this for the first time when I tasted a dark chocolate and orange ice cream at a local scoop shop in Pittsburgh over a decade ago. I was so captivated by that combination that ever since then I have never forgone an opportunity to savor a sweet treat that combines chocolate and orange. Last week I shared my friend Sneha’s Pineapple Mojito Smoothie recipe. She’s a fellow addict of the heavenly combination of chocolate and orange. For her birthday, I decided to surprise her with these Chocolate Cupcakes with an Orange Creamsicle Frosting. 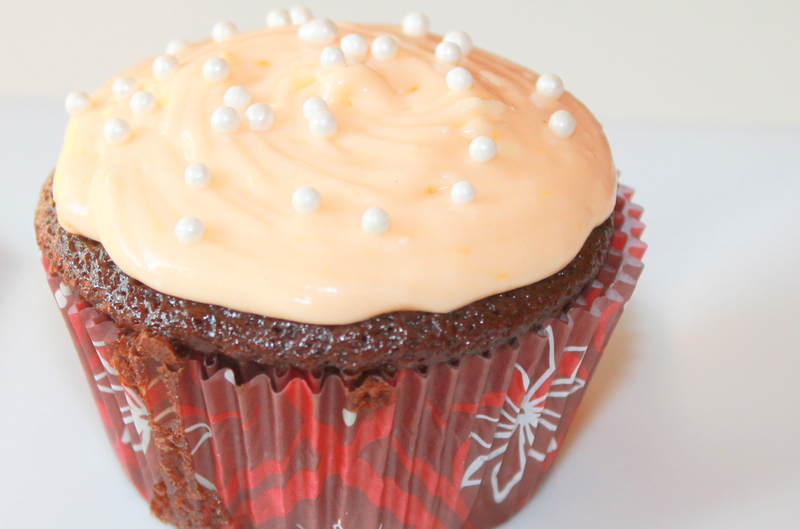 My recipe is adapted from My Baking Addiction’s – Chocolate Cupcakes with Orange Cream Cheese Frosting. 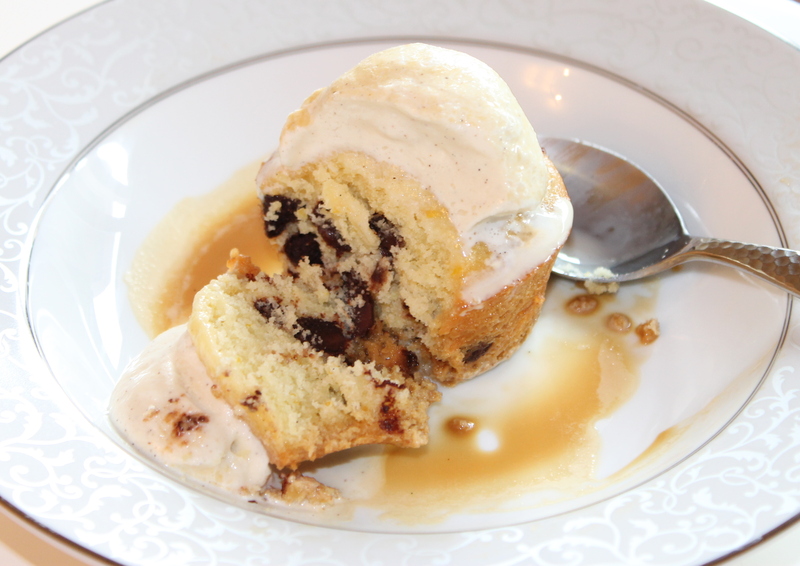 Jamie, the author of the blog has adapted this cupcake recipe from Ina Garten’s recipe. These are the moistest cupcakes I have ever baked. The addition of the coffee brings out the intensity of the chocolate and enhances the moisture. So even if you decide to make another frosting, do use this chocolate cupcake recipe for it. I made one minor modification to Jamie’s cupcake recipe by adding a little orange zest into the batter (which you can omit if you are pairing this cupcake with another frosting). I altered the original frosting recipe by increasing the butter, reducing the confectioner’s sugar and adding fresh orange juice. The result is a frosting that tastes exactly like an orange creamsicle. The chocolate cupcake with a slight hint of orange unites with the bold, creamy orange frosting to create a cupcake worthy of any celebration. Adding orange zest to the batter gives a slight hint or orange in each cupcake, which pairs well with the bold orange flavor of the frosting. If you want the actual cupcake to have a more concentrated orange flavor, you can increase the orange zest to 2 tablespoons. The cream cheese and butter must be at room temperature to cream well together. Make sure you set them on the counter top an hour before making this frosting. I used a lot lesser sugar in the frosting than the original recipe, as I added a few tablespoons of fresh orange juice. Please taste the frosting when it has combined in the mixer and add more sugar per your taste. Just make sure you use the mixer to blend in all the sugar. I added only a drop of food coloring to achieve the color in the picture above. If you want a brighter orange color add another drop. Store cupcakes in a sealed container in the refrigerator. Remove to room temperature 30-45 minutes before serving. 1) Pre-heat the oven to 350 degrees F. Line standard muffin tins with paper liners and set aside. 2) Sift the flour, sugar, cocoa, baking soda, baking powder, and salt into the bowl of an electric mixer fitted with a paddle attachment and mix on low-speed until combined. 3) In a separate bowl, combine the buttermilk, oil, eggs, orange zest and vanilla extract. With the mixer on low-speed, slowly add these wet ingredients to the dry ingredients. 4) Now add the coffee (mixer should still be at a low-speed) and stir just to combine. Scrape the bottom of the bowl with a rubber spatula to make sure all the ingredients are well combined. 5) Use an ice-cream scoop to distribute the batter evenly between 24 muffin wells. Each well should only be 2/3 full to allow the cupcakes to rise. 6) Bake for 18 to 22 minutes, or until a toothpick inserted in the center comes out clean. Cool in the pans for 10 minutes, then remove to a cooling rack and cool completely. 1) In a the bowl of a stand mixer fitted with the paddle attachment, cream together cream cheese, orange zest, shortening, and butter until well combined. 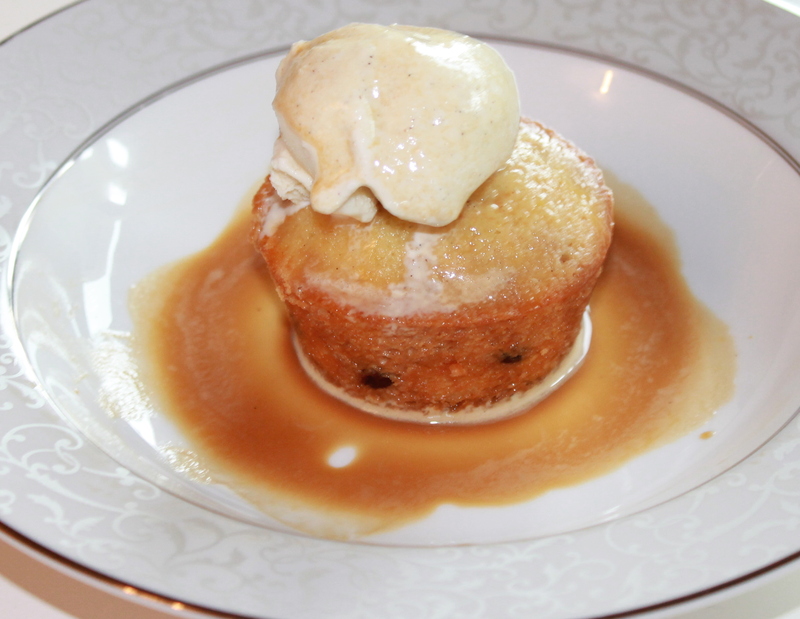 2) With the mixer of low, gradually add the confectioners’ sugar until thoroughly incorporated and smooth. Add vanilla and orange juice and mix to combine. 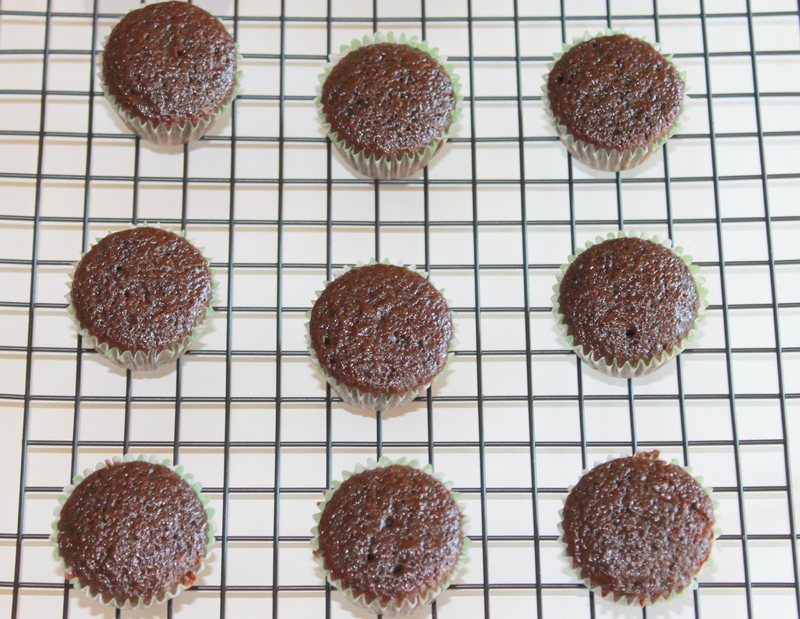 3) Use a piping bag or a mini spatula to frost the cupcakes with this frosting. This was the very reason why I signed up for Le 15 Patisserie’s Chocolate Lover’s class in the beginning of this year. I had been away from my husband for a month and wanted to do something really special for him when I returned to the US, just in time for Valentine’s Day. I know the way to my man’s heart is through his stomach, specifically if it’s a decadent chocolate dessert. The class was led by Pooja Dhingra, Owner and Executive Chef of Le 15 Patisserie. She went over several pertinent baking tips and techniques, while covering five scrumptious chocolate based dessert recipes. This class was really a turning point in my culinary life as it awakened in me a new-found love for baking. I have always been an ardent cook but baking desserts was not really my forte. Till last year my repertoire of baking included experimenting different variations of boxed brownies, cookies and cake mixes. The thought of measuring every ingredient and baking from scratch was rather daunting and required more patience than I possessed. Pooja’s class inspired me to start baking from scratch and along the way I have discovered that baking is a very de-stressing activity. Post the Chocolate Lover’s class, I called my husband gushing about my plans to start baking regularly. He was overjoyed and ensured that I would not change my mind by gifting me a Kitchen Aid Stand Mixer (a baker’s best friend) for Valentine’s Day. And so began the last few months of my baking experiments. 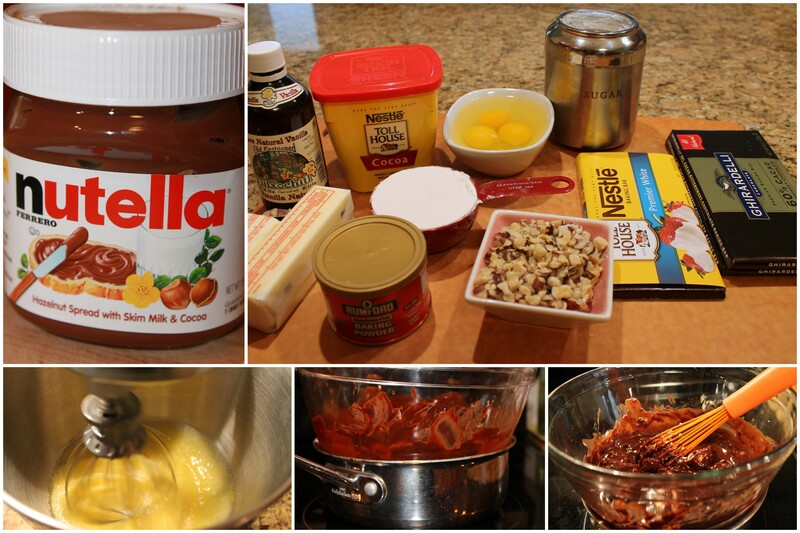 Of the five chocolate recipes shared in the class, the Nutella brownie recipe was my favorite. 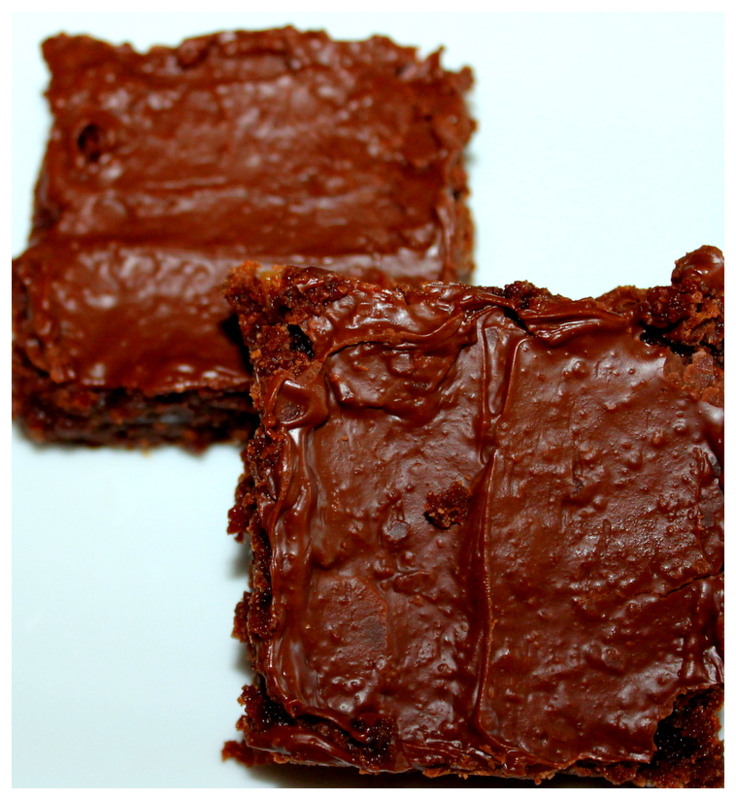 It marries together Nutella and chewy brownies – a sinful combination! Using lesser flour and using baking chocolate (instead of just cocoa powder), creates brownies that are both chewy and fudgy. While dark chocolate and hazelnut spread are the dominant flavors in this recipe the addition of white chocolate adds a remarkable creaminess to the texture of these brownies. After working on these brownies a few times, I have made a few minor modifications to the recipe shared in the class. In some countries where only salted butter is available, eliminate the salt from the ingredients. You can use walnuts in place of roasted hazelnuts. Never melt the chocolate directly on the stove top as it will scorch. Always use a hot water bath (double boiler) to melt the chocolate. Chewy and fudgy brownies do not break while being cut if refrigerated for 1-2 hours before cutting them. 1) Preheat the oven to 160°C (320°F). Grease and flour a 9” or 10” square baking dish and set aside. 2) Over a hot bath, melt together the butter, dark and white chocolate and cocoa powder. Use a whisk to keep stirring this constantly. Once melted, set aside till this mixture cools a little. 3) Whisk together the eggs and sugar until light and fluffy. 4) Sift together the flour, baking powder and salt (if using it). 5) Slowly pour the melted chocolate mixture over the egg mixture and lightly whisk it together. Be careful not to over mix. 6) Use a spatula to slowly fold in dry ingredients, followed by ¾ cup of the hazelnuts. 7) Spread this mixture into the greased baking pan. 8) Bake for 30-40 minutes or until a toothpick comes out clean. It takes about 35 minutes in my oven. 9) Set aside the brownies to cool in the baking pan. After the brownies have cooled down, generously spread them with Nutella. 10) Place the brownies in the fridge and let them chill for 1-2 hours. Once the brownies are chilled and firm, cut them into 2 inch squares. 11) Enjoy these brownies with some vanilla bean ice-cream or a cold glass of milk!